As soon as the listed papers were laid on the table during the Zero Hour, TMC members, legislators from Tamil Nadu and Andhra Pradesh rushed into the well of the House shouting slogans. New Delhi: The Rajya Sabha today witnessed repeated adjournments amid opposition uproar over the PNB banking fraud, special package for Andhra Pradesh and demands for constitution of the Cauvery Water Management Board. 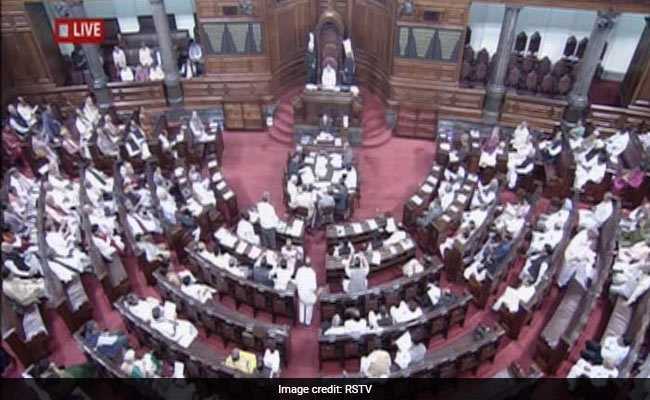 As soon as the House assembled at 2 PM after two successive adjournments, TMC members and legislators from Tamil Nadu and Andhra Pradesh rushed into the well of the House shouting slogans. Faced with constant sloganeering, Rajya Sabha Deputy Chairman PJ Kurien adjourned the House till 3.30 PM. Earlier when members reassembled, members from the TDP, AIADMK and TMC again trooped into the Well. Some of them were carrying placards. Kurien assured the agitating members that they would be heard one-by-one. However, members continued with their protests. "The chair is ready to allow discussions on any subject," said Kurien, adding, "by doing this you are stooping down to the level of hooligans". Display of placards is against the rules, he said and told members, "Do not do this... you members have dignity...This was not expected from members." I would ask the government to respond you". However, members were not pacified, following which the House was adjourned till 3:30 pm. Union Minister of State for Parliamentary Affairs Vijay Goel also told agitating members that the government was ready for a discussion. "We are ready for a discussion. Irregularities in the banking sector are not from today but from years. We are ready to discuss banking irregularities and other issues. The government is not running away from this," said Goel. Earlier, during the Zero Hour, Rajya Sabha Chairman M Venkaiah Naidu adjourned the House till 11.30 am. Reacting to the disruption, Naidu said, "I am not happy. I do not approve this sort of tactics". "This is proving the public impression...Parliament is not conducting itself in a dignified manner," he quipped before adjourning the House till 2 pm. Earlier, while TMC members raised slogans demanding that the alleged mastermind of the banking fraud Nirav Modi be brought back to the country, the AIADMK and DMK carried placards demanding constitution of the Cauvery Water Management Board for division of Cauvery water between Karnataka and Tamil Nadu. The TDP and a Congress member demanded implementation of a special package for Andhra Pradesh to make up for the loss after a separate Telangana was carved out. Naidu asked members not to shout slogans and display banners. "This is not the way. This is Parliament. This is not a bazaar," he said, remarks which went unheeded. He asked members to stop displaying placards. "You are insulting yourself. You are making Parliament a laughing stock in front of the people of the country," he said. Naidu said he cannot allow this to go on and adjourned proceedings till 11.30 hours. But before doing so, he asked leaders of political parties to meet him in his chamber to help resolve the impasse.